Small footprint high intensity UV curing system for adhesive curing. High intensity curing where UV energy can get to the photopolymer. The SCU110B is a high intensity UV spot curing system that uses a fluid optic wand to transmit UV energy for curing. The SCU110B is designed to give highly focused UV output in the 365 nm range. 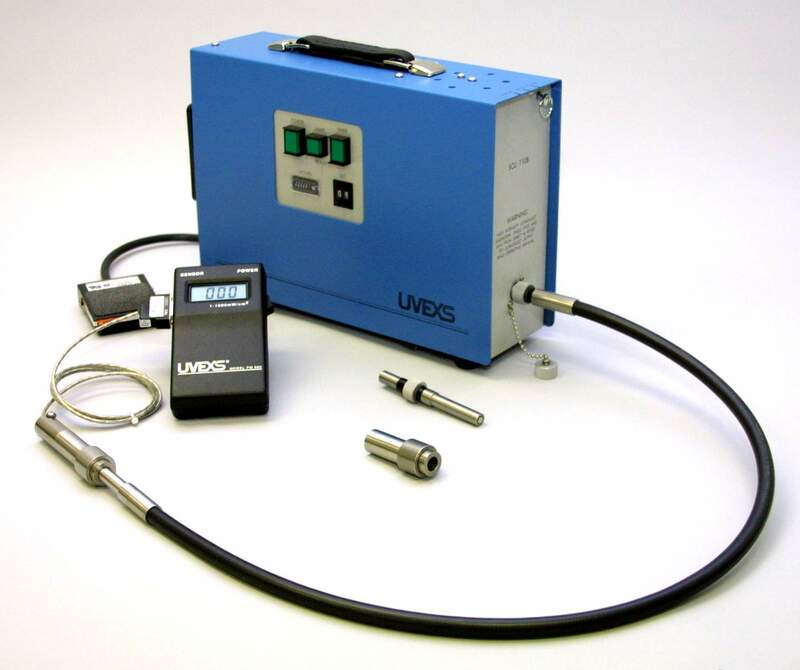 This wavelength is used for UV curing of adhesives, coatings and potting material requiring fast cure in small areas. Having a small footprint, an operator can activate the UV output with a foot pedal or the system can be set up for automation with a PLC/PAC. The desired exposure time is thus controlled with controlled timing and intensity accuracy, efficient for users whether in production or R&D. Typical cure times are one to four seconds, depending on chemistry exposure needs. Spot curing exposure areas are typically under a square inch. Parts that require 360 degree curing can be rotated through the UV energy to expose all sides. Multiple SCU110B units can also be ganged together with wands pointing to different parts of the assembly to speed up production cycle time. Individual assembly workstations can be setup to apply material and cure making it an ideal solution for fast manufacturing in cell or other production environments. The power supply includes a control timing circuits, a short arc power supply, a UV lamp, IR rejection optics, and a wand attachment. Control panel switches, fused power in and wand out connection. The wand can be placed in a holding fixture to provide the best cure angle leaving the operator’s hands free to move parts and dispense chemistry. The wand can also be handheld for variable cure angles and include various sizes. Operating controls: · System power: ON/OFF switch · Lamp start: auto-start (with system power) · Shutter timer: ON/OFF switch · Timer duration: digital selector, 1 – 59 seconds Indicators Hour meter, lamp operation Lamp status: warm up phase, ready phase Shutter control Manual: foot switch provided Remote: I/O cable to footswitch port available (requires contact closure, 115 VAC/1 Amp) Remote operation Option available for system operation I/O connector; system ON/OFF, lamp READY, and shutter functions. ORDERING INFORMATION Specify power for operation (110 or 220 VAC, 50 or 60 Hz).